The Jack Sack™: Joel Surnow leaves "24"
Damn, writers strike, Joel leaving the show ... what's next - is the wife going to leave me? 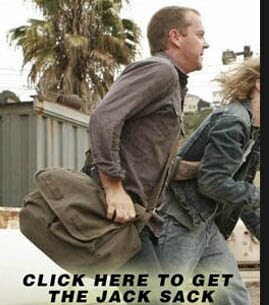 Yes, but it's for Jack Bauer, so you should be more honored than disappointed. If it was for Jack, I can live with it... I could also live with Tony or Curtis... or maybe even Chloe, hell, even Buchanan (Wait, does my wife read this blog?). As for football, I'm a Vikings fan so basically my life has sucked since the glory days of Jim Marshall. On the brighter side I'm a Celtics fan and Celtic pride is alive and well... after 15 years.